Before I start let me tell you something about Yandex. Yandex is a Russian company that operates the largest search engine of Russia. It is one of the most popular search engine and after Google, Bing, Yahoo, Yandex is most popular. In the beginning this search engine was available in Russian language only but now it is available in English also. As a search engine it also has features like other search engines such as webmaster tools for webmasters and bloggers. You can read more about Yandex here. Yandex is not so popular but it is one of the best way to get more traffic and a successful blogger is that who takes advantage of every means no matter its more popular or less popular. So if you are interested in getting more traffic and want to improve your seo, I recommend you to submit your sitemap to Yandex. Like Google and Bing, sitemap can be submitted to Yandex also but its too different from submitting sitemap to Google or Bing. Google and bing accept the normal sitemap i.e: http://yourblogurl.blogspot.com/atom.xml?redirect=false&start-index=1&max-results=500 but incase of Yandex this sitemap can not be used. Yandex will show you an error, shown in below image. So to gain visitors from Yandex you have to do something different and for the same reason I am creating this post. So follow below mentioned steps to submit your blog's sitemap to Yandex. Step 1: Go to Yandex webmaster tools and sign-up for an account. Step 2: After sign-up login to your Yandex account and add your site/blog. Step 3: Verify your blog by using the meta code(go to your blog template and add the meta code below <head>). Step 4: After verification, go to your Yandex account and click on my sites. Step 5: Click on indexing options in the menu on left hand side. 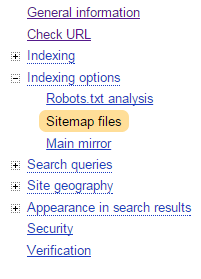 Step 6: Choose the sub-option "Sitemap files". Step 8: Click on add and you are done successfully. You can check your sitemap status by click on check. Note: Don't use http://your-blog-link.blogspot.com/sitemap.xml instead of it use http://your-blog-link.blogspot.ru/sitemap.xml because incase of .com Yandex is redirected to .ru(russian domain) which results in stopping of index. Hope you like this post and your found it helpful. If you have any question feel free to ask me in comments below or contact me. Follow and subscribe to get more seo tutorials for blogger. If you like this post, help me spread it by sharing it with others. Keep visiting 101Helper. Search tags: Seo guide for blogger, How to increase blog traffic, How to submit blogger sitemap to Yandex, Seo tutorials for blogger, 101Helper seo tips for blogger. This is one of the important post for bloggers. This information is very rare when we search in Google. http://your-blog-link.ru/sitemap.xml my blog link is naijabiggies. would i add the - symbol??? making it naija-biggies.ru please help. Thank you for your this. This help me alot in my blogger. This is informative, but i got confuse at the site link, i have custom domain can't i used it instead of ".blogspot.com"
If you have a custom domain you can directly use its link because there is no redirection. Go to your blog theme after visiting blogger.com and there click on Edit HTML. Now you will find a long code, click anywhere inside the code and press CTRL+F on your keyboard together which will open a search box. Now type < head> and search and paste the meta tag you got from yandx just below that head and save your theme.